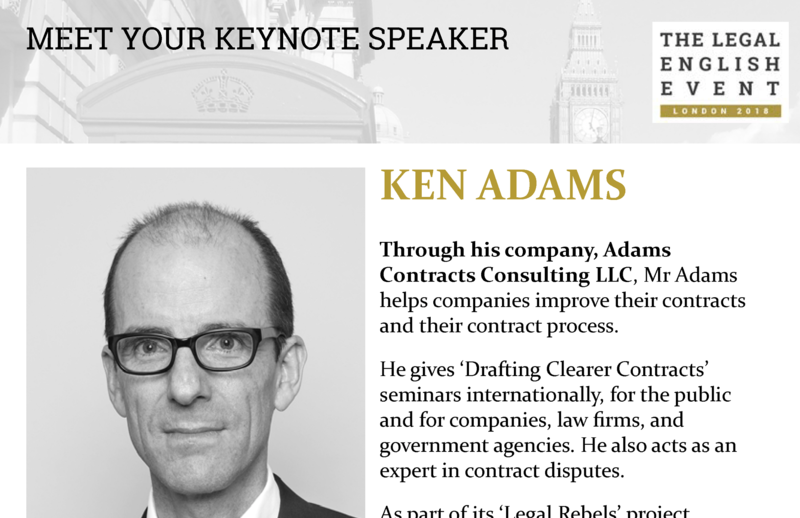 The Legal English Event 2018 is a unique assembly in the field of English language training for international commercial lawyers. It is an opportunity for lawyers, law students, legal translators and English language teachers to come together and look to the future of law and the future of language training for the legal profession. This is not a legal conference, it is an explosion of ideas, information and up-to-date professional development. Come and join us. Stay connected. Help shake things up. Attendees will receive a copy of the fourth edition of A Manual of Style for Contract Drafting at no extra charge. Among the other speakers is Alex Hamilton of Radiant Law, the only person I know who brings to mind the word “raffish.” (You might recall that he was on the panel at the UCL Faculty of Laws event last November; the recording is here.) He’ll be talking about legal tech. At some point in the proceedings he and I will appear together. Expect sacred cows to be slaughtered and oxen to be gored (although that’s perhaps more bovine and bloody than strictly necessary). The Facebook page is here; you can register here. I hope to see some of you there.